I love me a gooooood quiche! It's just a good way to start the week, don't you think? I like to make one up and eat it alllll week for breakfast. Or you can make it and serve it to a crowd. 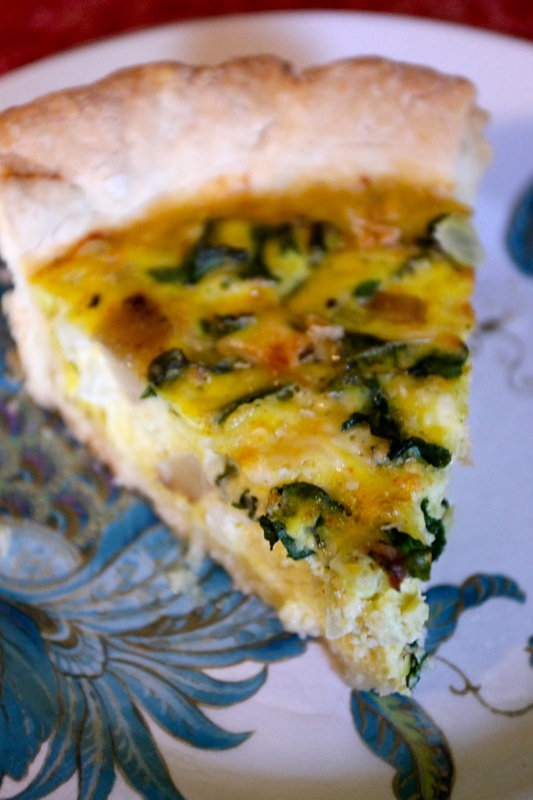 'Round these parts, I have tended to make a quiche or two....there was this egg white quiche. Then there was this Italian quiche. And there were these mini egg white quiches. Oh yea, and this quiche with hash brown crust! Today I am whipping up a kale and potato quiche using some leftover potatoes from pot roast, and some yummy yummy kale. Kale is so good, it definitely deserves two yums, as I am sure you will agree. Any-who, I have been obsessed with potatoes for a good part of my pregnancy; mashed potatoes, tater tots, potatoes in pot roast, hash browns--you name it! When you think about it, potatoes and eggs just go together sooooo well. So this is a match made in eggy potato heaven. I didn't take a bunch of pictures of how to mix it up and make it, so if you want those goodies, reference one of the above linked posts. What can I say? Pregnancy has made me more casual than I used to be. Let's take a moment to briefly discuss two things: 1) my obsession with Jiffy Crust and 2) the fact that you can throw just "whateva" in a quiche. First, the Jiffy Crust. I love it for these types of recipes, but as I always say, use what you are comfortable with. If you prefer a premade crust, I am not one to judge. Whatevet gets the job done works just dandy. But if you mix your own crust with crust mix, Jiffy Crust is awesome. Now, when making a quiche I feel like my "recipe" is mostly a "suggestion" of ingredients that you can use. I mean, yes, kale and potato and onion and cheese is an awesome combo, but if you have some lunchmeat you need to use up, or some great broccoli, throw it in there!! There are rules!! Be free! Okay, now that we got that covered, let's go ahead and get to the recipe! Happy quiche everyone! Time: About an hour | Makes 1 awesome quiche (Serves 4-6) | Difficulty: Easy! Line your pie pan with your crust. In a big mixing bowl, whisk together your eggs, sour cream and milk until combined. I use my big whisk for this job! Add your potato, onion, kale, cheese cayenne, salt and pepper. Combine fully and then pour into your prepared pie shell. Using a fork, gently situate the kale and other fillers so that they are evenly distributed. Bake in the oven for 45-55 minutes or until knife inserted comes out clean.